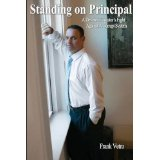 Frank Vetro, the author of "Standing on Principal" details his fight against the corrupt machine that tried to take his life away, and his ongoing crusade to make sure people are treated fairly. Public Corruption has plagued our nation. Scandals involving school districts, law enforcement, elected officials, and state offices are reported on a daily basis. Standing on Principal, is a gripping, first-hand account of widespread corruption involving the district attorney recently indicted in Suffolk County, and effectively outlines Long Island, New York as ground zero for corruption. Melding the fictional Fatal Attraction with the real life Duke Lacrosse and Penn State Scandals, Standing on Principal is an inspirational tale of a system that underestimated the tenacious character of a man who refused to be intimidated by a political machine. Frank Vetro is an Italian American whose family came to the United States so their children could have the opportunity they never had. In living out his family's American dream he pursued a career in education, quickly becoming the young, beloved high school principal in Hampton Bays, NY. In February 2006 his promising future came to a halt. He was arrested and thrown in jail for a crime he didn’t commit, and what authorities publicly described as an act of terrorism. Standing on Principal details the arrest, nights in jail, court proceedings, and the subsequent fight to clear his name. After losing everything Vetro fought back and recreated his life. He currently works with local courts and school districts on Long Island, educating youths who have been arrested and kicked out of school, and need a second chance. Frank also serves as a board member for a non-profit organization in New Jersey and Manhattan. The mission is to promote racial harmony and acceptance, and assist all youths in the growth of positive values and self-worth. Continuing his comeback, Frank hosts two radio shows, “Standing on Principal” and “The Frank Vetro Show”, broadcast live on WLIN Radio. They’re a blend of law, politics, and news commentary while also providing a forum for the public to unite against corruption and injustice. His shows have attracted politicians and other high profile guests. Frank has interviewed nationwide, held book signings, and contributed to monthly newsletters. He’s a mentor and life coach, and his public speaking has captivated audiences. He shares his tragic yet inspirational story in hopes of helping others and spurring change.